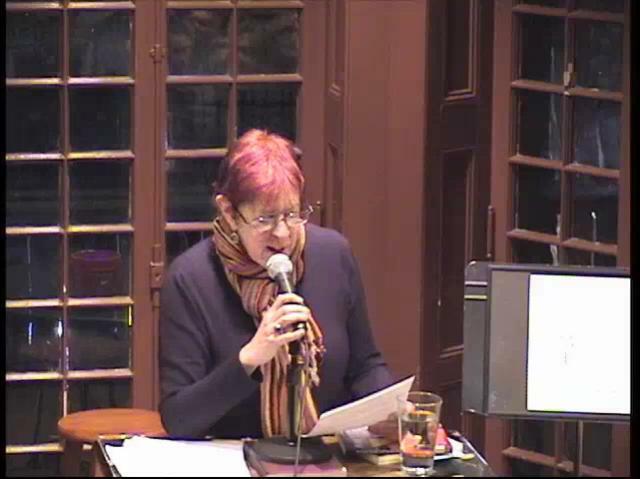 Today we're highlighting recently posted audio and video from Rachel Blau DuPlessis's March 3, 2011 reading at the Kelly Writers House as part of the Whenever We Feel Like It reading series. The poet was introduced by series co-curator, Michelle Taransky, who begins by observing that, "If Rachel Blau DuPlessis is a theater and a library, she is that library where strategy is strategies, and reading and writing happen in halls that are doors that are windows, and Drafts are the stage directions of the furniture and the characters, and in ever already-existing hole there is a 'how' — that reason to write towards, towards a feminist practice that may disrupt other practices, may render another order, where the other writes these Drafts to an other." "The Drafts are pieces," she continues, "The Drafts are our ancestors and the figure about to be figured. It might sound like what is owned is owed and what is marked is marred. Within the who as a how and the how is hero here. Drafts is a built place, always being built again, where reflection and invention keep the unsettled observation and make these texts at once perfect and incomplete. Drafts identify the problem of how to write and how to keep writing. That there is a process here where autobiography, textual analysis and revision make sites of struggle that are also sites of revelation and remaking, and difference is cast across every page and breath." Due to a last-minute cancellation by Elizabeth Robinson, DuPlessis' set goes for the full hour alloted, and she begins with a number of selections from her absent reading partner before moving on to her own recent work. 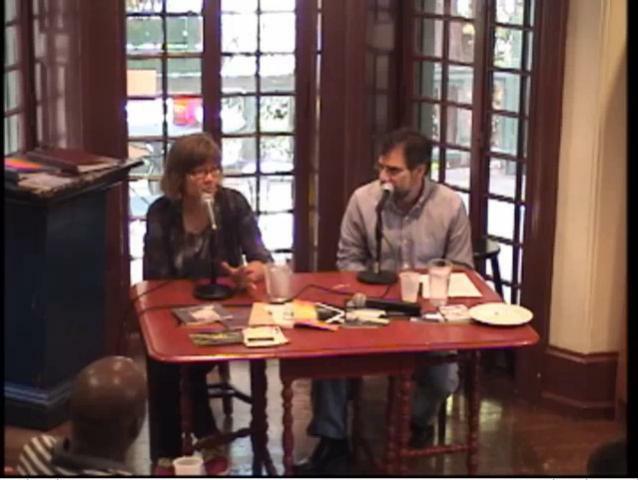 You can listen to and download the complete event, or watch streaming video on DuPlessis' PennSound author page. DuPlessis was recently honored with a day-long celebration of her life and work at Temple University, and while promoting that event on Jacket2, we also announced and previewed a forthcoming J2 feature on DuPlessis, organized by Patrick Pritchett. As a PennSound tie-in to that impressive body of work, we hope to have recordings from the Temple conference, as well as a special Studio 111 session of new poems that I recorded with Rachel last winter. Keep an eye out for all of those very exciting things in the near future. We close this week out with a treasure trove of new materials from the marvelous Susan Schultz, including audio, video and an interview transcript over at Jacket2. Schultz traveled from her home base of Hawaii to our own Kelly Writers House for a multi-day "mini-residency" this fall, which included a September 14th reading of new poems from the forthcoming collection, Memory Cards, and a September 15th lunchtime talk with Al Filreis. Audio and video from each of these events has been posted on Schultz's PennSound author page. We're also very happy to launch "Insistent Memory" today on Jacket2, a transcription of a classic Cross Cultural Poetics conversation with Leonard Schwartz, recorded December 22, 2008 and aired as part of program #180 in the series, "Dura/Dementia" (one of five Cross Cultural Poetics shows featuring Schultz that you can hear on PennSound). Schwartz was serendipitously visiting Philadelphia during Schultz's visit and the two took part in a PoemTalk recording session, a neat reciprocation of sorts, since Schultz's Dementia Blog was the subject of PoemTalk #40, for which Schwartz was one of the panelists. Schultz also edited an ambitious feature on Pacific Poetries, which was a major part of Jacket2's launch. Brian Ang continues to explore the Language poetry scene of the late-70s and early-80s in his latest PennSound & Politics commentary for Jacket2, tackling one of my favorite pieces in our archives — Henry Hills' Money (1985), which he describes as "a fourteen minute collage film of split second shots of performances by and conversations with experimental musicians, poets, and dancers in public and intimate spaces of Manhattan." "The indiscriminate and energetic mix of music performances, poets reading from books, and dancing combined with performers' conversations and the bustle of the streets enacts the mutual conditioning of cultural production with the structures of lived experience," he continues. "The confluences of lived experience, peculiarly intense in urban areas, form the consciousness for producing music, poetry, and dance which in turn materially constitute culture's institutions in the superstructure and the subjects produced out of them." Ang then goes on to discuss the "atomized" aesthetics — in terms of both gesture and language — that Hills' quick-shifting cinematography yields before offering, as a final appraisal, "Money is a formal and representative joyous affirmation of counter-hegemonic experimental arts culture: 'the' 'analysis of this' 'you know' 'I don?t know' 'you know' 'anti' 'capitalist society.'" 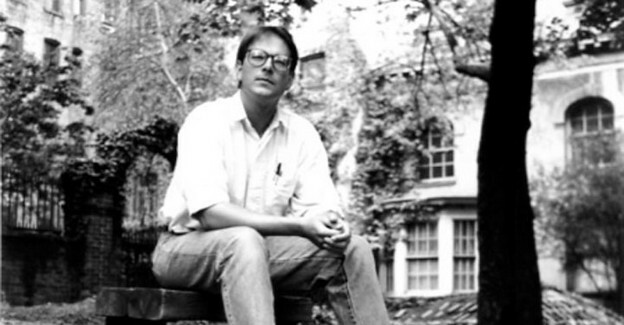 You can read that and all of his other "PennSound and Politics" commentaries on Jacket2 and stay tuned as Ang jumps forward in his next post to address Barrett Watten's November 1999 set at the Kelly Writers House. Over the past few weeks, we've highlighted a number of recent video offerings, from Henry Hills' Money and new additions from George Kuchar to Public Access Poetry and the Paul Violi memorial reading, and today we continue that trend with Anya Lewin's short film, How to Be European. 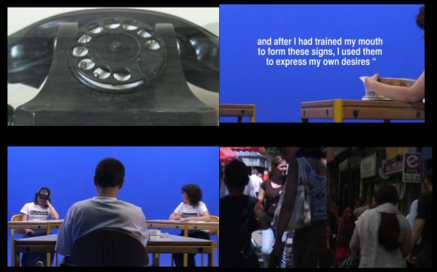 How to Be European, created during a three-month residency at InterSpace in Sofia, Bulgaria (as part of the At Home in Europe Project) was inspired by Lewin's lessons in Bulgarian with Boris Angelov. "The lessons question who learns and who teaches and whether European identity exists for anyone but Americans?," she explains. 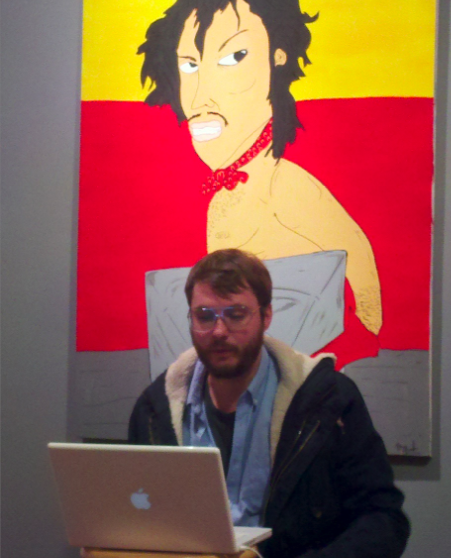 "The work uses a mixed methodology of pre-written Socratic dialogues, bad acting, experimental visual techniques, educational television, obscure references and poetic news reading and covers concepts such as time, language, economics, flow and mobility, dog watching, and cultural presentation." Lewin then considers the broader implications of these ideas: "Imagine a school where one learns how to be European in a changing Europe. Migration flows from East to West to East again. The EU is growing, yet doesn't include every 'European' country. It is getting more and more complicated to understand what European is and most importantly how to act European? In 1974 the sociologist Erving Goffman published his book Frame Analysis, which examined the way behaviour changes depending on the context. In a classroom we know how to act as teacher and student; can we extend this idea to Europe? When countries enter the frame of the EU do they become European?" You can watch How to Be European on Lewin's PennSound author page, where you'll also find a number of supplemental links, including her homepage, where more of her work is on display. We'll stay with the spirit of cine-poetics as we close the week out with a new video from Nick Piombino. 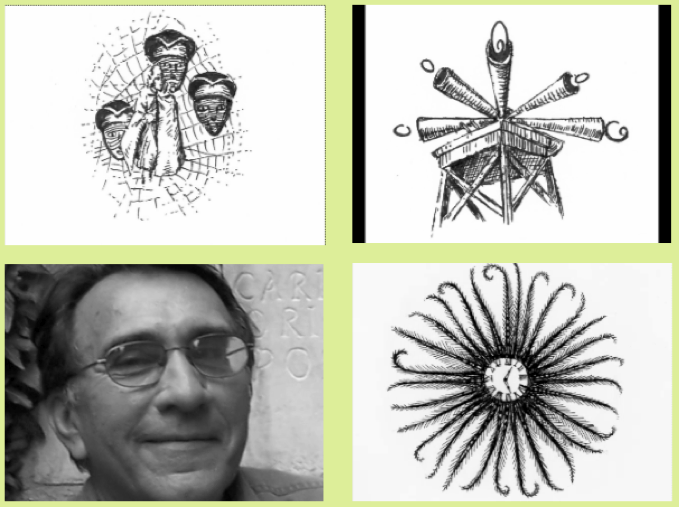 This past January, Piombino read from his latest book, Contradicta: Aphorisms, at the St. Mark's Poetry Project, where he was accompanied by his wife, Toni Simon, who projected new drawings inspired by her collages from that collection. Complete audio from that event is available on PennSound's Piombino author page, however it's missing the charming collaborative interplay between word and image. That's why we're happy today to highlight a new video, created by Simon, which combines a brief excerpt from that event with the artist's illustrations. "Inspired by the notion of the dialectic in the work of philosophers such as Hegel and Bachelard, Piombino created his idea of paired aphorisms he calls contradicta, recasting the classic form of the great aphorists such as La Rochefoucauld, Blake, and Emerson in a contemporary context. Instead of presenting a single point of view, the pairs reflect on and resonate with each other, and sometimes even contradict one another. Piombino has said that the contradicta replicate some aspects of psychoanalysis in which two individual viewpoints are juxtaposed, working together to achieve understanding and insight. Piombino's poetic, wise and witty aphorisms are well complemented by the humor, warmth and lyricism of Toni Simon's collages, which offer a telling slant on the contradicta, as well their own vivid visual dimension." You can watch this video, and listen to the complete reading, along with many other recordings spanning four decades on Piombino's PennSound author page. Rosmarie Waldrop's book Shorter American Memory consists of prose poems collaged from documents collected in Henry Beston's American Memory, a book of the late 1930s evincing an Americanist zeal for early documents. Beston's historicism seemed a liberal effort to restore and include in the American story, as it was being retold during the Depression, a wide range of Native American as well as both obscure and classic "founding" or "first encounter" Euro-American writings. By appying various constraints to these documents, Waldrop rewrites Beston by "taking liberties" — an intentional pun on her part — with the gist of the anthology and its very length. In doing so, she (to quote her publishers at Paradigm Press) "unearths compelling clues into America's perception of its own past, developing a vision of America vital for its intelligence, wit & compassion." 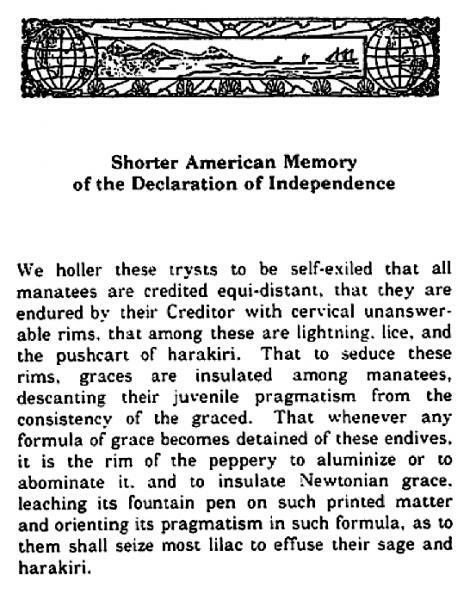 We at PoemTalk decided to take a close look at one of these prose poems, "Shorter American Memory of the Declaration of Independence." A performance of this poem, preceded by a short introduction, was recorded at Buffalo in 1992. The main work of that reading was to present many chapters from Key into the Language of America, a project related to that of Shorter American Memory in several ways we mention in our discussion. As a warm-up to Key, she read three of her writings-through Beston: ours on the Declaration, a second on Salem, and a third on "the American Character According to [George] Santayana." Here is a link to Waldrop's PennSound page, where these and many other recordings are linked. Al felt especially pleased to be joined on this occasion by Jessica Lowenthal (the poet, Director of the Writers House, and former student of Waldrop at Brown), Julia Bloch (co-editor of Jacket2), and Johanna Drucker, who was visiting us from Los Angeles that day for a talk on materiality and aesthetics, which turned out, unsurprisingly, to be stunningly suggestive and exciting. This episode of PoemTalk was, we think, masterfully edited and sound-adjusted by our long-time editor, Steve McLaughlin. Thanks to the digitorial work of Danny Snelson, Shorter American Memory has been made available in its entirety as a PDF downloadable from Ubu Editions. Earlier this week, Brian Ang posted his latest PennSound & Politics commentary, focusing on a 1999 reading by Barrett Watten at the Kelly Writers House, which collages poetry and criticism from 1-10 (1980), Bad History (1998), Poetics Journal 10: 'Knowledge' (1998), and criticism eventually collected in The Constructivist Moment: From Material Text to Cultural Poetics (2003)." Watten begins with "Mode Z," the first poem in 1-10, the book strategically chosen to begin the non-chronological Frame (1971-1990). Watten adapts this organizational gesture to the composition of the poetry reading. 'Mode Z' consists of New Sentences calling for the clearing of the past and the present agency to construct the future: 'Could we have those trees cleared out of the way? / And the houses, volcanoes, empires?' 'Prove to me now that you have finally undermined / your heroes.... Start writing autobiography.' Its repetition in 1999 reaffirms its permanent revolution, self-critically exceeding Watten's own subjectivity, since in the nineteen years since 1-10 a new generation of poets has developed with Watten as a hero to be potentially undermined, evidenced by the adulatory introduction by the younger Carine Daly. The alternation of "Non-Events" and Bad History is a superb pairing to close the reading considering its obsession with history. Bad History's back cover reads, "the poem looks back on the decades previous and forward toward — a duration of events, which, because the poem is in history, do not cease to occur. The poem, too, becomes the event of its own recording." Within the poetry reading's special temporality, sections of Bad History's "event of its own recording" and the "duration of events" that were its occasion and the "Non-Events" "generating meanings that would be extended, I hoped, almost indefinitely" can be seized by their organization for their possibilities of knowledge. The reading, too, becomes the event of its own recording, and because it and its contents are in history, they do not cease to occur, as expressed by "Non-Events" and reading's final line: "The manual is rewritten one word at a time." Ruth Perry of MIT [shown at left] has written a chapter for a volume being edited by Ellen Pollak, A Cultural History of Women in the Age of Enlightenment, to be published by Berg/Palgrave. This work will be part of an illustrated, six-volume Cultural History of Women being assembled with a general audience in mind. Ruth Perry's topic is Anna Gordon Brown, whose repertoire of English ballads was the first to be tapped and written down by antiquarians and literary scholars in the eighteenth century, at a time when scholars feared that the oral tradition was in danger of disappearing forever. It turns out that Ruth Perry, aside from being an eminent scholar of the ballad tradition in English, is a talented ballad singer herself. As of today, PennSound has added to its "Classics" page a studio recording of Perry performing "Burd Ellen," generally deemed to be one of the most beautiful of Brown's ballads. Ruth transcribes "Burd Ellen" in her forthcoming chapter, and discusses it as well. 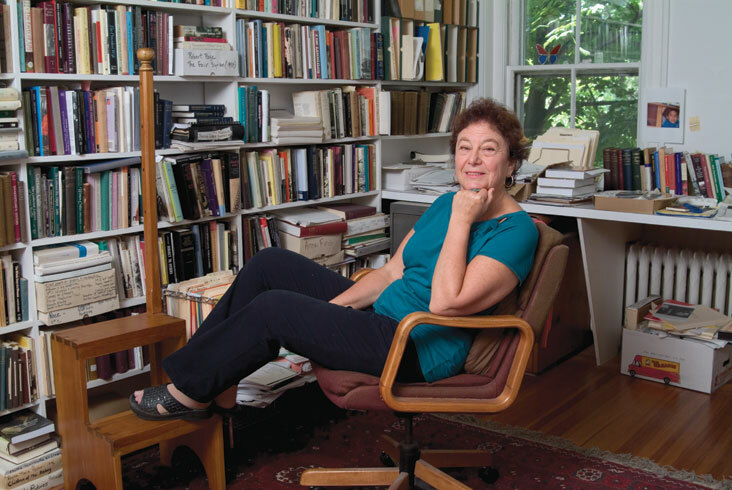 It is the hope of Ellen Pollak that the published book will refer to the PennSound URL so that readers can have easy permanent access to the recording, without the need of a CD inserted into the book. We at PennSound are happy to help with this project and any similar endeavor. You can read more about the history of the piece in Filreis' J2 commentary, and to listen to "Burd Ellen" and many more interpretations of pre-recording poetry — from the ancient Greeks to Walt Whitman — be sure to visit PennSound Classics. Just before heading back east for Thanksgiving, I had the pleasure of catching Thom Donovan (shown at left) and cris cheek read as part of Dana Ward's Cy Press reading series at the Thundersky gallery. Though a Cincinnati local for seven years, cheek notes that this is his first proper reading in the area. His set for the evening consists of "almost completely new work," roughly divided in thirds between the in-progress manuscripts Hungry Ghosts and Is No Nearer, along with very recent material written over the past few days. "It's going to be the most conventional reading I've ever given in my life," he notes, adding "maybe" after a pregnant pause. These pieces are punctuated by a handful of older work, including "We Are One" — a piece dating from 1980 which cheek has never before read or published, however aside from sounding utterly contemporary, it offers a "semblance of a sense of the procedural things I'm up to" — and the phonemic duet (or perhaps trio) with pre-recorded glottals (issued by two large speakers held head-high) that concludes the reading. Similarly, Donovan's set is largely brand new, with many of the pieces inspired by his tireless participation in the Occupy Wall Street movement, including his stunning opening poem, which effectively channels Hannah Weiner's "Radcliffe and Guatemalan Women," juxtaposing Mayor Bloomberg's speech defending his eviction of the Zuccotti Park occupiers with the protestors' demands. Speaking of Weiner's poem, he observes that it "provides a really interesting use of appropriation and for arranging texts in particular ways, even just putting them beside one another in a very crude way." While much of the set is political in tone, there are also a number of pieces inspired by Donovan's interest in dance, movement and somatics, including "Two Dances for Leavening" and "Dumps (after Jennifer Scappettone)." You can listen to two other events from the Cy Press series, including recordings of Stephanie Young, Brandon Brown, Arlo Quint and John Coletti on our homepage for the series.